A wild ride, from start to finish. -Pure Fantasy, curbed to fuel a human-interest story. That could easily annoy either side; People here for the fantasy and surreal, and people here for the Dramatic Human-Interest. Each is tied into the other, so people who like their shows solidly grounded in realism, or completely light-hearted and whimsically fantastic may be annoyed. My Opinion: This goes into my Glory section on my list. I keep a record of everything I've ever watched, and am watching, so that if something pops into my head, I can go find its name. I may never forget a story or plot after finishing it, but I rarely remember names. The Glory section is the top anime I've ever watched, the first of my recommendations to anyone looking for something to watch. 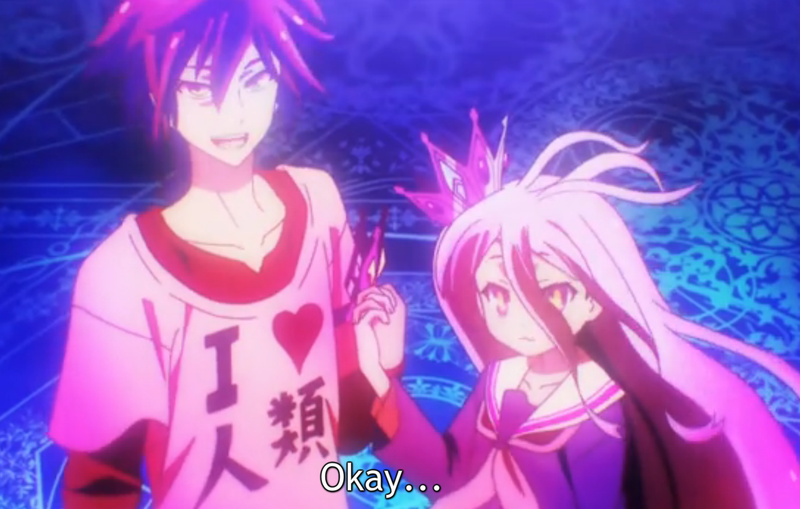 Counter to its appearance as a Magically Fantastical show, No Game No Life is centrally a Human-Interest driven show. From start to finish, the Characters and the plot they drive are what you're here to see, the fantastical colors and animation simply bring it to life. After having two...maybe three, curse my vague memory, anime recently promise a Second season right on the end of their first, I was greatly pained to not have that same promise for No Game No Life. This story isn't done yet, and I want the rest of it dammit! Even if the unfinished part is wholesome and complete within itself, who wouldn't want to complete the puzzle? Impartial Judgement: Don't be put off by the summary description that the main characters are shut-in gamers, after establishing that as a character element, they quite literally throw them out of that trope into the middle of the story's new world. After that, you have to adapt to the glaring rainbow colors of the animation, while still soaking in the major plot elements that they casually drop here and there near the road. No Game No Life is a show that begs being paid attention to, down the the tiny details, and I'm informed that some people don't like that kind of show, and prefer something they can watch more casually. There's enough spontaneous vibrancy in the various scenarios Sora and Shiro get into on their path through the new world they land in, that it keeps the blood pumping. They don't drown you in important things, but it definitely adds to the shows appeal if you pick up on them. with an honorable mention to its Plot and Story. I'm tempted to give the show an award additionally for its Plot, but it is technically incomplete. The Story is a closer runner, because the story completes with the end of the anime, even though the Plot continues on past that...still, I'm not inclined to give an award to something incomplete. If this show ever gets a second season, it will be hard pressed not to receive an Award from me for Best Plot.